Recent release “Sassy Ann and Teddy Bear in Oz” from Page Publishing author Elaine Macejak is the compilation of fan-favorite stories, and original tales, featuring the ventriloquist’s best-known puppets. Author and illustrator Elaine Macejak has completed her new book “Sassy Ann and Teddy Bear in Oz”: a series of adventures following characters the author has created, across the magical world of Oz, first seen in the Oz series by author L. Frank Baum. Published by New York City-based Page Publishing, Elaine Macejak’s tales are meant as much to serve as entertainment as they intend to express small lessons at the end of each story. By incorporating the familiar world of Oz, Macejak works within the realm of canon while also taking liberties with the setting to create new magical fields for children’s and the author’s imagination to explore new adventures. 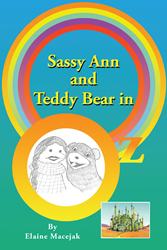 Readers who wish to experience this creative tale can purchase “Sassy Ann and Teddy Bear in Oz” at bookstores everywhere, or online at the Apple iTunes store, Amazon, Google Play or Barnes and Noble.